White chocolate can get a bit overlooked, especially when up against milk and dark. I’ve shared many chocolate cake variations on my blog, and dark chocolate fudge cake is one of the most popular flavour choices when I make custom cakes for friends and family. Whilst super sweet white chocolate might not be quite as sophisticated in comparison, I still really love it - probably because it reminds me bingeing on white chocolate buttons as a child! 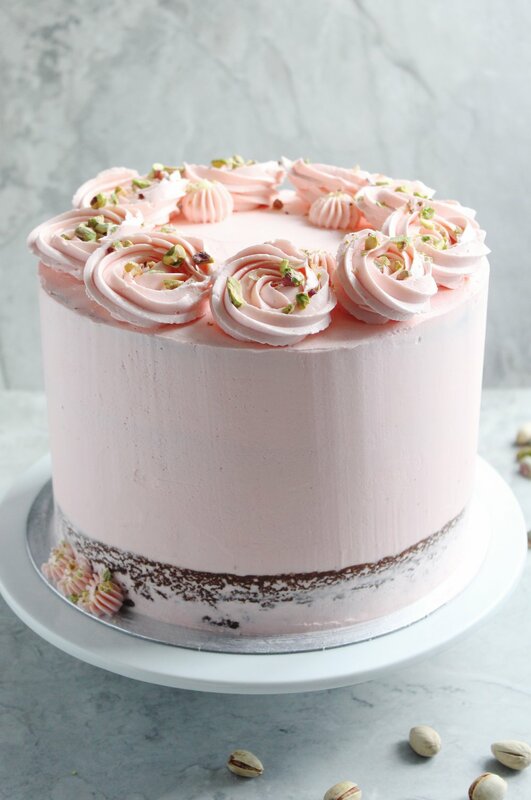 The pistachio paste might seem like it'll take a lot of effort to make, but believe me - once you combine it with the buttercream for the filling, it'll be totally worth it. In fact, it's just topped my ultimate cake filling list (shortly followed by lemon curd)! Although I think rose water rounds this recipe off perfectly, I left the buttercream flavour open ended. I love the floral aroma of rose water, but appreciate that it’s not everyone’s cup of team (my boyfriend included). If you’re not a fan, coconut works really well here, and if you’re STILL not a fan, then vanilla is a fail-safe winner for sure. Oh, and how could I not finish the cake with some floral buttercream swirls?! For this technique I used a JEM 1M nozzle - piping the swirls by starting inwards and working outwards. You can practice on some baking paper before piping onto the cake, but once you get the hang of it, it's really simple (and quite therapeutic!). Finally, finish the cake with a sprinkling of chopped pistachios, then slice and enjoy!